This delicious, yet simple Mashed Sweet Potatoes Recipe is the perfect low calorie side for many fall dinner recipes. Sweet and savory, each half cup serving is just 2 Points and packed with fiber and vitamins. The trick is to bulk it up with a bit of butternut squash. You can’t taste the difference, the texture is about the same, but it helps to cut out some carbs and calories, thus keeping the Weight Watchers Points low. A bit of nutmeg helps give these mashed sweet potatoes a bit of seasonal flair, and the sour cream and half and half help keep them moist and creamy without the extra fat of lots of milk and butter that are used in traditional mashed potatoes recipes. This is an excellent healthy fall recipe to serve this season! Enjoy. 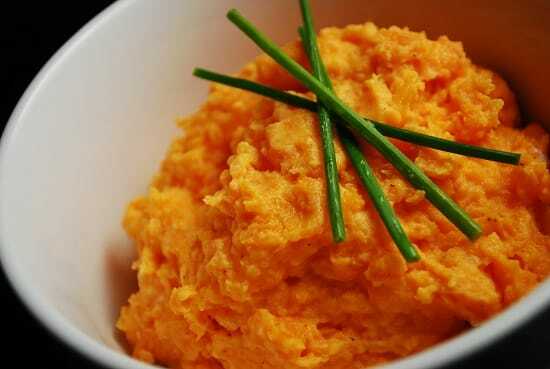 Creamy, sweet, and savory, these low calorie mashed sweet potatoes are a must make this fall. They are so easy to prepare and are just 2 Points per serving. Add in potatoes and set heat to medium high. After 15 minutes, add in squash. Let simmer until squash and potatoes are tender, about another 10-15 minutes. Drain potatoes and squash and empty into a large bowl. Add in butter and half and half. Stir in sour cream, nutmeg, and salt and mix well, using a rubber spatula. Looks like amazing and healthy comfort food to me!